"We make a living by what we get, but we make a life by what we give”. With July being a reminder of a month of giving back, we would like to share Frontline Underwriting Managers involvement in an initiative we hold very close to our hearts, as Paul Myers, Frontline’s CEO said, "One of the greatest things about my job is that, through the establishment of Frontline Underwriting Managers, we have been able to set up a wonderful charity organisation named the Paw-Paw Foundation”. The Paw-Paw Foundation provides funding to charities, projects and people who dedicate their lives to uplift, feed, educate and engage disadvantaged communities. 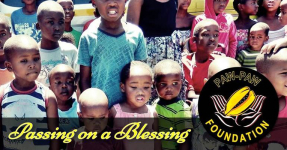 The foundation supports over ten charities and orphanages in and around Kwazulu Natal, Mozambique, Uganda and various other regions of South Africa. They have a feeding scheme called the ‘ZiphakeleGardens’ that we have set up in Cape Town, Durban, Inchanga and Lesotho name a few. They focus on an assortment of self-help projects in order to maintain long term self-sustainment for disadvantaged people. Many of you might have a few questions to ask as to why the charity is named the Paw-Paw Foundation? It all came about one day, when one of Frontline’s oldest employees – and definitely the matriarch of the Company at the time, Zelda Botha, picked a perfect pawpaw from a tree in her garden. It was green at the time, so she let it ripen on the kitchen window. A few days later it had ripened perfectly and so she decided to take it into the office for lunch. Paul Myers saw the pawpaw and remarked that it was probably the most perfect pawpaw he had ever seen. Zelda then insisted that Paul take it home to enjoy with his family. When he left for home that afternoon, Zelda happened to be behind him in the car. At the robots there was a beggar and not having anything on him to give, he gave him the pawpaw. And so the Paw-Paw Foundation was born, and the catch phrase "Passing on a Blessing” became its motto. The Foundation’s origins go back to 2003 when Frontline was newly established and only had very little to give, but somehow always found time and resources to help others. And as Frontline has grown, so has the Paw-Paw Foundation and today they have a number of permanent staff who tirelessly work towards making lives better for a multitude of people. Frontline are particularly indebted to Kim Matthews who heads up the Foundation. This truly remarkable person with an indomitable spirt has been the backbone of the Foundation and has personally been instrumental in the successful launch of a number of ambitious initiatives. The Paw-Paw Foundation has been a blessing to all of us at Frontline, as we firmly believe that within every human being there exists an innate desire to care and nurture others. Paul would like to end off with a quote from Mother Teresa that warms his heart, "Not all of us can do great things. But we can do small things with great love”. Paul believes that, "this has to be the very cornerstone of all humanity. The sum total of all the little things we do (in love), manifests in society at large. It’s why the human race has prevailed for so long. And it is the sum total of all the little acts of generosity and sacrifice from all our donors, sponsors, staff and volunteers that enables the Paw-Paw Foundation to be actively involved in a myriad of worthy causes”. Frontline would like to give our sincere gratitude to all of you for your support and generosity over the years. It is truly a blessing that we are able to make a small difference in the lives of the underprivileged. If you would more information on the Paw-Paw Foundation, you can visit the website here: Paw-Paw Foundation.